Jack Maslen (right) and Worthing Raiders head coach Jody Levett. 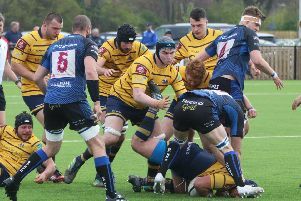 Jack Maslen agreed on a return to Worthing Raiders yesterday. Winger Maslen has spent the previous two seasons at nearby Chichester but is now back with Raiders. The 27-year-old began his career in Raiders' age-group teams and was a member of the senior squad when they secured promotion to National League 1. Maslen brings a bundle of experience to Raiders, with many hoping he'll reach double figures in terms of tries this season. Raiders assistant head coach Ben Coulson said: "Having Jack back in the squad has added to our options. Having been a Raiders player for more than 20 years, we know exactly what he can do and the excitement he can bring to the game. "Jack decided to play for Chichester two seasons ago and his return is more than welcome. We look forward to seeing him cross the whitewash many times this season."